A significant part of the cost of an SAP implementation is assiciated with the development and customizing of forms. In order to save costs, form development is often given to the hands of inexperienced in-house employees or junior developers of the consulting partner. The result, the, are poorly programmed, inflexible and faulty forms, which in the following years lead to permanent displeasure of the users. Eliminating errors in forms remains a persistently significant expense item in the organization’s IT budget. Our core competency is the creation of top-quality SAP forms in conjunction with a continuous reduction of the costs involved in the development and output of forms. Nothing is more important in our business as practical experience. With more than 18 years of experience in SAP Form development, we are able to provide you with forms at a fraction of the usual cost in excellent quality. Our methodological approach ensures a high degree of efficiency, professional development combinde with high quality. The cost reduction by up to 70% is a completely realistic scenario. Whenever possible, we use the solidforms form templates. They give your SAP forms a uniform structure and limit individual developments to a minimum. The solidforms form templates in combination with the tools of the solid.FormKit force the developer into a fixed corset. Even if another developer takes over the form at a later date, he must move within the limits of the corset. This gives you a high degree of investment protection over a long period of time. In our forms, the data collection and the form layout are always separated from one another. The form consists only of variables and is only available in one language. Nothing is hard-coded. All data is determined at runtime from the application object and the customizing. This clear, transparent and comprehensible approach greatly facilitates the maintainability and extensibility of the form. Many form elements, which are modified according to experience, have been removed from the form and made available as a customizing object. The solid.FormKit is the central tool with which users can make changes to the content of forms without programming. You no longer need to hire a developer for every little change. Your IT budget is significantly relieved by low maintenance costs for SAP forms. Our form development follows a clearly defined scheme. Nothing is left to chance. The project starts with an initial workshop on the clarification of the basic conditions. The realization phase follows with the execution of a clearly defined test plan. In the end, the success check is followed by an inspection report. 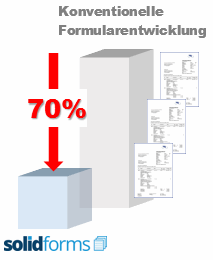 In many SAP projects, we have been confronted with the most diverse requirements in form printing. There is practically almost nothing we have not yet encountered. In this way, we can ensure effective processing of your requirements. In the area of ​​SAP Form development, we offer you the following services. How to turn your project into a lighthouse in the project is shown in our chapter “Project Management”. You will find our methodology in SAP Form development in the section “About us”. Notes for advanced form development for SAP can be found direct on the SAP homepage. I’d like to learn more about SAP Form evelopment.